The function of the powdered glass is purely mechanical. 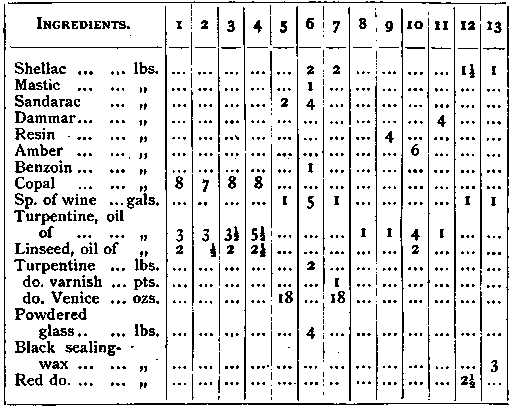 (For a table of the solubilities of various resinous materials, see p. 598). Orange shellac ............ i£ oz. Sandarac ... ... ... ... ... ij ..
Methylated spirit, 66 over proof...... 20 ozs. Sandarac ...... ........ 2 ..
Canada balsam ............ 60 grs. Oil of lavender ... ......... 1 oz. Methylated spirit ............ 16 ozs.